Richard Hardin's GPWF: All Sicknesses Are From The devil! So Pray Correctly! All Sickness Are A Curse From The devil! *****So pray correctly to close the door you have opened to allow him to come in. God will not allow the devil to come into you unless you have opened a door yourself to the devil. And you can close the door anytime you choose, so pray(talk to God), read His promises and find our what you have been overlooking or disregarding! ****Richard Hardin, POBox 45684, OKC, OK 73145. ****I will give any minister (anyone really) $10,000 for his/her ministry that will go through my programs with me and show from the Scriptures that I am wrong about calvinism being a lie of the devil. ****You can also find my programs on Itunes. ****If you haven’t made a personal search of the Scriptures about healing and causes of sicknesses and other bad things in your life, you are missing a lot of God’s promises and blessings for your life and your loved ones’ lives. How do I know? Because, ministers do not go to Seminaries or other Bible schools to learn God’s Pure Word. They go to their schools of choice to learn how to preach and teach the Scriptures according to their denomination beliefs of choice. ****God’s presence, His Spirit is healing. Proverbs 4:22 states that God’s Words are life to those who find them and health to all their flesh. In Deuteronomy Chapter 28 where the blessings and curses are listed, not one sickness is on the blessing side, and all the sicknesses are listed as curses. Proverbs 26:2 states, “As the bird by wandering, as the swallow by flying, so the curse causeless shall not come.” There is a reason for your curse(sickness). Exodus 23:25 states, “And ye shall serve the Lord your God, and He shall bless thy bread, and thy water; and I will take sickness away from the midst of thee.” In Hebrews it states that Jesus is the foundation of our new and better promises, so I guess to get any better than Ex 23:25 above God will bless our air too! I hope today’s message will encourage you to seek the Lord and close any doors you have open to the devil that allows him to bring curses into your life or your family too if your are the spiritual leader of your house. The only way sickness and other curses can get into our lives is through doors we each individually allow to open to the devil. Listen and see how you might have let the devil in, and then you can shut the door and God will kick satan out as long as you continue to make choices according to God's Pure Word! I am not just saying just you, I have to answer to the same requirements, no one gets a free pass! It is like being at the judgment seat of Christ, when God speaks His Living Word Christ to us, we have to choose to accept or reject, and when we reject Christ, the Living Word to us, we are opening the door to satan to bring his curses into us while we are rejecting Christ and His Living Word! You can change your live today even if you are already a Christian, by choosing to seek God with all your heart, study His Word and open your heart to receive His Pure Word by closing the open doors you have to the devil. ****Order a couple of my books and you will see more clearly what I mean by God's Pure Word. 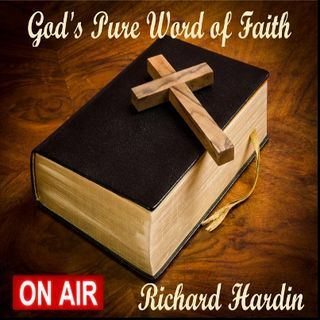 on @ KLRNRadio.com CST Mon #GPWF #Christian or rahardin.com, Radio.